January | 2019 | Quirks Ltd. The pictures and info in this post may be a repeat for you if you are also my FB buddy. I spent part of yesterday felting a sweater. I have got some GREAT texture now. The main peach color was a cotton yarn, I believe, so it did not felt at all. And the wools……..yummy felting! The mixed blends are very interesting, as well. And I want to use it right now! It will make fabulous landscape material, even though I don’t usually do landscape type pieces. So I’m pondering…do I go ahead while the enthusiasm is high and dive into this or should I stick with my original 2019 plan to explore more painting? Or clean up more old projects? Distraction or exciting new project? It’s winter, it’s snowing, I’m not going anywhere and I want to play in the studio. Maybe I can do it all today! One of these days, I need to add some more quilting to that Garden Grid quilt. I’ve never been satisfied with the way it turned out, so obviously that means it’s not finished! It really needed more quilting and I knew it from the beginning. I was simply tired of the straight line work and wanted to call it done. Of course, that means taking off the hanging sleeve. They come off a whole lot faster than they get sewn on! With the wider quilting, it was hard to distinguish the flowers from the grid. With only a few rows added, the difference was noticeable. And by the time I finished the entire grid, it was much better! There is a size difference on the edges that I am very unhappy with. I need to figure out a fix for that…and I think it’s more than blocking or pressing will cure. We shall see, but I sure am much happier with the amount of quilting. And it didn’t take that long to do…just one of those things that I’m gonna get around to, one of these days…and today was the day! Hmmm…wonder how it would look if I added some heavy cording over the top of the dyed grid to make an actual gate or fencing effect. Or maybe I’ll call it good and leave it alone! I’m pretty sure that I have a few other ‘one of these days’ projects around…all I have to do is clear a shelf or move a box and I’ll find one. It might finally BE one of these days!! Text and Texture is the challenge I am working on right now. It’s not due for almost 3 months, but when the idea strikes, you have to roll with it. There was one thing for sure that I wanted to get on the top before I attached a backing and did any quilting. Cording is always eye-catching and I wanted to create an image that looked like writing but not actually BE writing. Paper–always an easy way to create the image, even if it’s a pain sometimes to remove! I secured things in a few places and then added an envelope back. Several rows of stitching around the edge and it was ready for quilting. I did not have a real plan, as usual, but knew at some point that I wanted to have stitching that looked like cursive writing but not real words. I didn’t quite achieve that because it turned out to be impossible for me to do without thinking of and using real words. But I did it upside down and from the back so it’s not really readable…I think. When I pinned it up for blocking, I’m not sure it’s exactly what I want. It may stay like this or it may need some more stitching…but for now, I’m done with it. And since you can’t tell the size from these pics, it’s about 26 x 37, so fairly large. Don’t know yet if I’ll procrastinate on the sleeve or go ahead and get it done. Tomorrow could bring something to distract me, and I could……………..squirrel………….!!! Making a quick switch from the precision planning and graphmaking of the weekend, to the improv challenge project that I was working on previously. I realized that I haven’t even mentioned it on the blog, maybe because it was so far onto the back burner. It’s moved to the forefront now, because it’s a tiny start to what I wish to study this year. Oh, also it is the last project I have lying around with a deadline! I have wanted to make paper fabric and have even tried with less than wonderful results before. Thought I’d give it a try again for use with this challenge. So I started with newspaper pieces on fusible interfacing. So far, so good. I watched several videos and one of them used a layer of fusible next, rather than a liquid glue product, so that’s what I went with. Added my favorite item–stuff– to the next layer, and followed another suggestion to add a layer of tulle. Even gave it a layer of paint and planned on using it with a piece of painted/printed fabric. I did not take any other pictures of the fabric paper, but I added quite a bit more paint before I thought it was interesting enough to use. I wanted to rip it into pieces for use, but it didn’t want to rip. Too sturdy for that and yet easy to stitch through. So I proceeded with trying to design a piece. This was getting way too busy, way too quickly so I walked away for a while to think about it. When I came back, I gave the elements a bit more breathing room and this is where I’m at. The green and yellow background is wool so there is a lot of texture going on. This is pretty much the design as it will finally live, but there is a lot of stitching yet to be done. I’ll get back at it today and we shall see what happens! Today’s design workshop with Heather Jones was so much better than I had anticipated. Oh-that sounded bad! I expected a good workshop and this one went beyond my expectations. Now, let me remind you that I have been drawing, re-sizing and designing quilt blocks for close to 50 years. (Yeah, I’m old–you just hush now!) I was originally drawn to quilting by the wonderful patterns and graphic designs, the geometric precision of piecing. And my total immersion in improvisational work for the past 15 years has moved me away from that. We brought inspirational photos. No problem…I’ve been taking them forever, but I really haven’t been using them. I will be now! Step 2 was to decide what we were drawn to and what we wanted to emphasize from our photos. Then a rough sketch. Refine the sketch. Figure out size/ratio, colors–all the quilt math parts. Abstracting what we needed from each photo——-I haven’t done that in just about forever. Many of the students refined through several iterations and got very abstract designs. I took the easy way out for the first one. I tell myself that I abstracted it as much as possible before I took the photo, but uncertainty in the process is the real truth. I started feeling braver, so I went with only a sketch for the next one, because I’m pretty sure I’ll piece it improvisationally. And I had time to start a third one, which I feel that I have abstracted more to what was important to me in the photo. I may or may not execute it in black and white, but after making the drawing, I’m leaning towards some bright, high contrast colors. Bottom line on the day–I was reminded of how much I love drafting and drawing out designs. I remembered what drew me to quilting. I was inspired by the design/abstraction/drawings of everyone around me. I am full of enthusiasm about precisely drawn designs again. This day filled me with love of my chosen art form, happiness to share it with like minds, and true joy. This is why I take workshops! Spent all day Friday at a guild sponsored workshop. The teacher was Heather Jones and the subject was working with large scale blocks/patterns. It was very refreshing to look at design and construction from her perspective. I always arrive everywhere nice and early, thanks to my dad’s training, so I had plenty of time to get set up. Only needed 3 fabrics and I was proud of myself for only bringing 15! Actually, it was only the fabric for the center square that was undecided, so I brought several black/white fabrics from which to choose. The cutting and construction went very, very quickly. I was completely ready for the borders a full hour before class was scheduled to end. But then I decided that the plain black borders just weren’t going to work for me, so I tried out several options. First, just a thin strip of the black and white that I used in the center. That was okay. Then I added a strip of the print fabric to the mix. Yep–that’s what I decided to use. However, that meant more cutting and stitching so that last hour was totally filled trying to speed sew and get it DONE! I got all but that last black border on, so I left the workshop feeling really, really good! FYI-I sew the two narrow strips together before I attach them to the quilt and then miter the corners. It’s much easier to keep the stitching a bit more precise when you are holding small pieces than when you have to hang onto the whole quilt. Those black borders could have been attached and mitered, too, but they are 9 1/2″ wide and easy to handle. Simpler to attach separately. Looking forward to the second workshop with Heather. 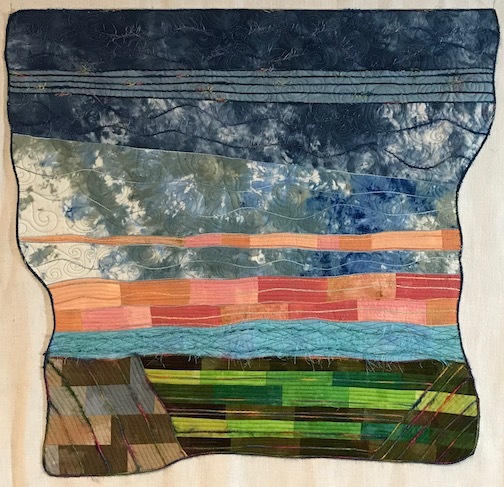 She will be teaching us how to abstract a design from an inspiration photo and turn it into a viable quilt pattern, shapes, measurements and all. Haven’t worked in this manner for years and years, so I’m eager to get her take on it.